Samsun Destroyer has been completed in 1907 by Normand in France. She was a Durandal class French destroyer. They were built with a turtledeck forecastle with two masts and two funnels. This class had ajor problems with their boilers. 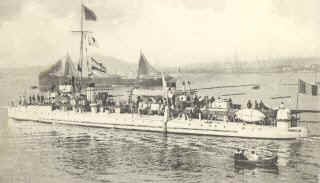 According to the Turkish resources, Samsun destoryer under the command of Lt. Cdr. Nezir Abdullah from Uskudar has been sunked near Hora (Khora) in sea of Marmara in 14th of August 1915 by the English submarine E-11. But according to the foreign sources "COnway's" and "Jane's Fighting Ships", this ship survived the war with her two sister ships from the same class. The photograph is another ship's from Durandal class.